Quick Fix: Joan’s on Third! | Delicious! Delicious! Quick Fix: Joan’s on Third! The radio BLARES at the very second that it changes to 6:30AM. A hand reaches out and smacks it so hard that it turns off. Only half a face is nestled into a plush pillow. The other half is obscured by a warm quilt that happily smothers the rest of the body too. Punky, perched upon his throne of the other pillow, wakes and stretches his front paws out onto the half face. A hand pushes down the covers, revealing a groggy Caryn underneath. She swats away the paw on her face. Punky stands up, hunches his back and walks out the stretch. He sniffs Caryn’s face before giving her nose a dry, sandpaper lick. She squeezes her eyes tight for a second before they pop open wide. Sunlight is already bouncing on the bed. Caryn bolts upright and spins to the clock: 10:30AM! She jumps out of bed, sending Punky flying from the room. She SMACKS her toe into the nightstand. She hops into the bathroom. The dust settles in the sunlight as Punky cautiously peeks back through the bedroom door. The Honda elicits a chorus of horns as it squeezes in and out of traffic. Caryn, with sopping wet hair, is too engrossed on her cell phone to notice. No, Flora, don’t tell him anything! I’ll be there in a twenty. She tosses the phone on the seat and grabs her mascara from her purse as she barely misses the bumper of a pretty Ferrari she carelessly cuts off. The narrow and brightly lit room is packed. Caryn takes advantage of two chatty and oblivious women to manuever herself ahead of them in line. She peers at the virtual array of sumptious fare in the shiny glass cases: a myriad of fresh salads, grilled vegetables almost too perfect to eat, macaroni and cheese cut into thick, gooey squares. As she waits for the man ahead of her to finish placing his order, she stands on her toes to get a look at the other counters further down the line. On one end is a glass case filled with a half dozen different kinds of cupcakes and an assortment of muffins and scones. The case on the other end of the store displays desserts so decadent, it’s hard to tell exactly what they are. Caryn eyes a few selections covered in rich, dark chocolate. Caryn gives the waiter her best Chesire-Cat grin. Caryn dashes in with a couple shopping bags labeled “Joan’s on Third.” Flora takes them from her hands and immediately starts unpacking them as Caryn grabs serving trays from the cabinet. They pop open the plastic containers and dump the contents into bowls: curried chick peas, lentil salad, crisp green beans, mushrooms and walnuts. Caryn lines the bowls up on the tray and garnishes it with fresh french bread. She rushes out with Flora following with plates and silverware. Caryn re-enters, now much calmer. She takes a deep breath and finishes unpacking the bags. She arranges a couple cupcakes and scones on another tray. 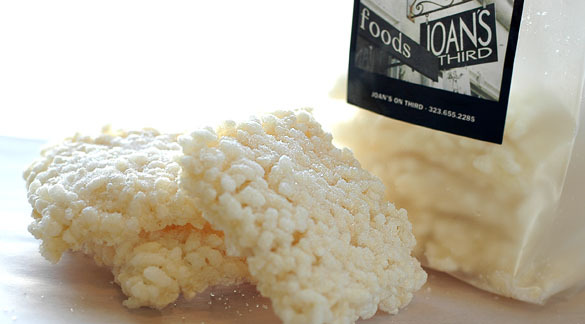 Finally, she opens a slightly opaque bag of crisped rice squares. She stacks them neatly in the center of the tray and steps back to examine the arrangement. Pleased, she crunches into a rice square of her own and takes the tray to her waiting boss. I’ve only recently discovered this absolute gem of a restaurant and gourmet marketplace. If you’re in a pinch for something good enough to serve to guests, this is the place to go! The food is outstanding and prepared with expertise and an eye towards perfection. They also have a small selection of artisan grocery items. The puffed rice squares (pictured) are a sort of rice crispy bar for grown-ups, toasty and light. ← Warming Up: Chicken & Artichokes! Wow, Joan’s saves the day. Nothing like sleeping in! I was at the bookstore yesterday and ran into a new paperback entitled “Delicious”. It’s a story about a restaurant owner having to hire the best chef around to turn around his restaurant. That chef being his ex wife…interesting, and made me think of you. Oh man, I love Joan’s on Third. I go there when I’m in town on business. Have you been to the cookbook store across the street? Wahou, are you a photographer ? Your photos are gorgeous ! Joan’s is a great little market, and that cheese case! WHOA! However, I was a tad bit disappointed to find a piece of wood/toothpick/debris in my fancy Joan’s cupcake a few weeks back. Bummer! love your photos and your writing! i guess we are neighbors… but you know how that is around here… you might as well be living in Maine =) looking fwd to more of your creativity! Cheers! agreed – breaths are bated! Hope all’s well, and that you’re able to update soon. you must have some serious writters block. Either that or something has happened. Which I really hope not. Don’t worry us like this. Come and post something. Anything! I totally missed the address – it just looked very NYC! Yay, it’s in LA…will now be able to check it out this weekend! I’ve only just discovered you, and have already read you top to bottom….PLEASE post soon and keep this site up! it’s too good not to! I love that you’ve combined your passions into this very unique food blog. Great job! Ok, it’s been four months to the day since we have had an update here. I’m begining to get seriously worried that something has happened. If you no longer want to keep up this blog let us know. I am sure I am not the only one who has been worried. Yeah, I guess it’s time to delete my book mark for this site? That’s a shame, I truly enjoyed it. Hope all is well, Caryn. I hope everything is ok with you.I love this blog ,been reading it for some time now ,doing some of your recepies too,some ingridients are hard to find here in Brazil but it´s ok …please be ok! I’m so suprised I never noticed such a good blog before! I totally love the way you write, it’s really interesting. N your photos are fantastic. Guess I’ll be coming here often! same here, i have been checking from time to time but nothing updated… hope all is well! i found this blog and i quickly went through all the archives… i really enjoyed it. even if it has been a year or so, the writing and recipes and photos are too good to not check up on once in a while.. is this blog not being updated anymore? please let your readers know if yes or no.. i hope you are doing well. I am heartbroken that you haven’t updated for over a year. Please come back! Your readers need you! I still check back occasionally with baited breath that there is a new post and that you returned when I wasn’t looking. I guess today is not my lucky day. Ditto comments above. Discovered you yesterday and spent much of my work time reading…and after work reading…and first thing this morning reading…so that I am all done! Need more Caryn & Mr. R! the picture made me drool. Cool picture and great blog also! Did you die? If not, please let me know what happened to your blog? I really need to go to LA and tries these. Love the pics the rice squares look delicious! Hi, just discovered your blog and just fell in love with the writing and story line. The pictures and recipes have me drooling. And now I’m depressed that it hasn’t been updated in 2 years. Please come back. Old readers and new readers alike are sad and worried. I love rice cakes! Those look delicious! Hi, Caryn. I recently discovered your blog and finished reading through the whole thing last night. When I got to the end of it, I was very sad to discover that you haven’t updated in 2 years. I agree with everyone else who’s said it- Please write again soon. Even if it’s just a quick note to reassure us that everything’s ok and that you’re doing well. Hi there, Haalo of Cook (Almost) Anything At Least Once and I are fighting with Chef Al Rosas who stole our pictures. Haalo just told me that they also stole your Eggplant Parmesan Cheese picture. Please check out my posts or Haalo’s post and let’s all expose his shameless acts. I know Beth, I too check back about every six months to see if there are any new posts. I’m so sad. It’s been 3 and a half years since the last post. And we have no way of knowing if something happened to Caryn. Hi there, I am casting a new food show for a major network and stumbled on your blog. I think you would be an amazing candidate for our host! We are looking for someone who loves food, dining out, and has the skinny on where to get great eats for cheap! If you are interested please email me.